Rather than giving your personal tablet to keep your little one busy, Samsung want your toddlers to get a device of their very own. The Galaxy Tab 3 Kids provides a kid-friendly user experience that can also be controlled by parents. Featuring a large colourful 7 inch display, easy-to-use interface and parental control function – perfect for delivering hours of entertainment. The Galaxy Tab 3 Kids is a tablet specifically designed to be used by children whilst including functions that allow the tablet to be used by parents too. The Tab 3 Kids features a colourful 7-inch display, front & rear camera, parental controls, normal tablet mode and impressive hardware. If you’re looking for a tablet that’s great for keeping the kids quiet even for a few hours – the Galaxy Tab 3 Kids aims to delivers endless entertainment. One of the most striking differences between this tablet and the regular Tab 3 is its vibrant all-over yellow colour. 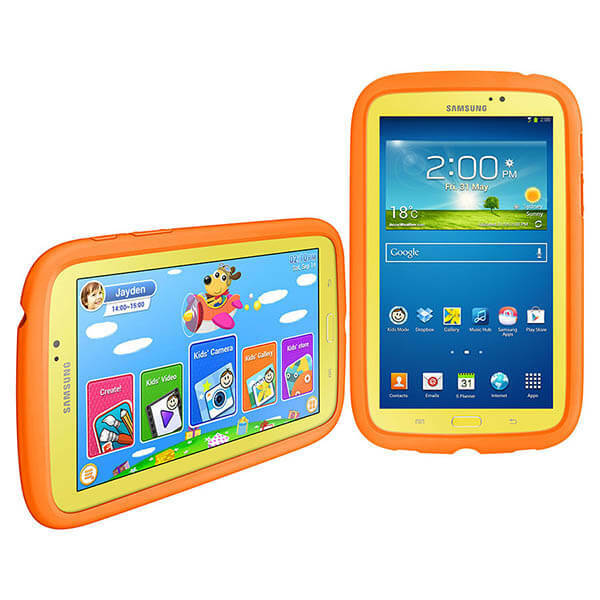 The Galaxy Tab 3 Kids comes with an included removable rubber orange case which features slots for the headphone jack, camera, speakers and charger. The case is super durable, lightweight and keeps the device some extra grip when placed on a reasonably flat surface. The overall design of the tablet itself is compact and rugged, the small design allows for a comfortable grip for extended usage – especially for small hands. Fitted with a 7-inch screen, the 1024x600 resolution is more than enough for viewing pictures, playing games or watching movies. Colour reproduction is exceptional, providing you with punchy colours and a dynamic range of vibrant shades. When watching movies you can expect to pick up on every detail as the display shows a perfect contrast balance. The screen is also very bright, allowing your little ones to view at any angle and also under direct sunlight if you’re out and about. The Galaxy Tab 3 Kid is split into two different tablet modes – there’s an adult mode which uses the standard TouchWiz version of android and then there’s the kids mode. In adult mode you will find a UI that looks and operates the same as your regular android tablet. In adult mode you’re able to do anything you could do on a regular tablet, whether it’s checking emails, watching youtube or downloading applications. The best thing about the adult mode is its integrated parental control panel. From here you can designate which apps and media files are available to your child, time limits and even enable or disable the internet browser. When the time comes to pass the touch onto your child because they won’t stop complaining, all you need to do is tab the ‘kid mode’ to switch, and when you want to go back to adult mode just hit the symbol and enter your custom PIN. Kids mode features everything you would expect from a kids user interface. There isn’t any grid like applications, widgets or multiple home screens. The main menu is cartoonish and includes tonnes of fun animations such as moving clouds, a pop-up cat and other animated objects. The screen is filled with vibrant colours and interactive characters such as a dog who can be made to perform actions when tapped. There are quite a few cool things about the homepage such as the pop-up cat, animated objects and moving clouds – perfect for adding an extra layer of entertainment and engagement to keep your little one quiet. From this home screen your child can access all the apps you have enabled from adult mode, these include a bunch of learning apps, games, front & rear camera and even a fun to use image editor! Equipped with a dual-core processor and 1GB RAM, the Tab 3 Kids is designed for entertainment purposes and performing basic tasks so any more processing power would be overkill – unless your child enjoys running multiple windows at the same time and needs to run the latest and most demanding applications. Overall performance is ultra-smooth with excellent responsiveness, allowing you to play games with little to no lag or freezing. Powered by a non-removable 4,000mAh battery, the Galaxy 3 Kids has a reasonably good battery life since it doesn’t have the highest specs. You can expect the tablet to last approximately 9 hours even with heavy usage such as watching films and browsing the internet. Perfect for distracting kids on long-haul flights or lengthy road-trips.